fig1. JUICE explorer illustration. Copyright: Spacecraft: ESA/ATG medialab; Jupiter: NASA/ESA/J. Nichols (University of Leicester); Ganymede: NASA/JPL; Io: NASA/JPL/University of Arizona; Callisto and Europa: NASA/JPL/DLR. In May 2012 the European Space Agency approved the JUpiter ICy moons Explorer (JUICE) mission. This is the first Large-class mission chosen as part of the ESA’s Cosmic Vision 2015-2025 programme. 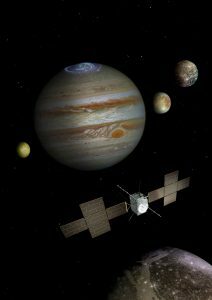 JUICE is aimed to study Jupiter and to investigate the potentially habitable zones in the Galilean icy satellites: Ganymede, Europa, and Callisto. One of the most important sets of science goals for JUICE is related to the study of the subsurface geology and geophysics of icy moons and to detect possible subsurface water. 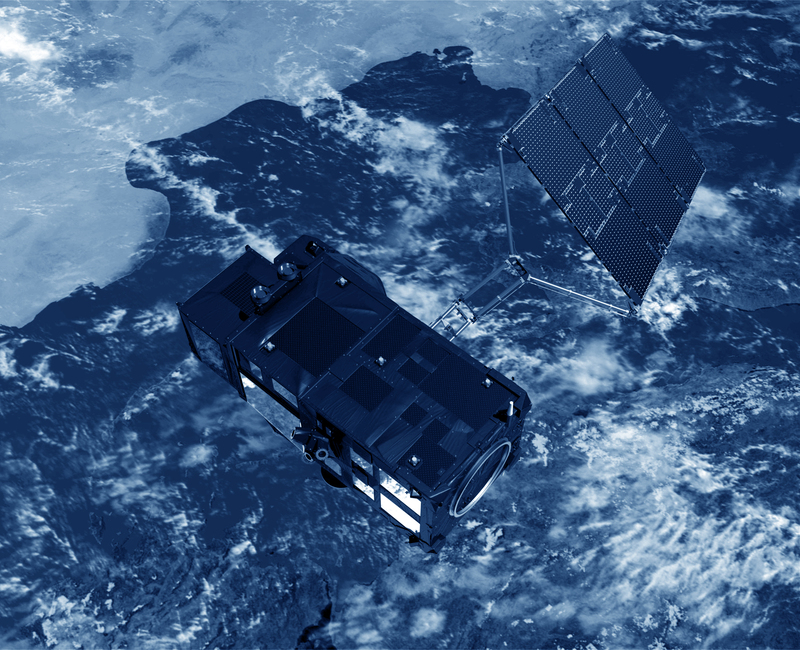 RIME (Radar for Icy moon Exploration) is a radar sounder optimized for the penetration of the Galilean icy moons, Ganymede, Europa, and Callisto, up to a depth of 9 km. This is a nadir-looking active instrument which transmits radio waves with the unique capability to penetrate deeply into the subsurface. Orbit Jupiter and Ganymede tours and Europe and Ganymede flybys. Two main operation scenarios are foreseen for RIME: flyby observations of Europa, Ganymede and Callisto and circular orbital operations around Ganymede at the end of the mission. According to these scenarios, RIME will explore the icy shell of the Galilean icy satellites by characterising the wide range of compositional, thermal, and structural variation found in the subsurface of these moons. These subsurface observations will provide insight into the dynamic history of the satellites, test models of the formation of their surface features, and constrain the distribution of deformation in their ice shells as well as global and regional surface ages. Scientific measurements can be performed in two different resolution modes: high resolution and low resolution (using 3 and 1 MHz chirp bandwidth, respectively). The low resolution mode will be used to reduce data volume when observing deep sounding targets. RIME offers a wide flexibility in terms of acquisition parameters during measurements. Moreover, it foresees a calibration mode (receive–only) in which no pulse is transmitted and the instrument only records the output of the receiver. Within the high and low resolution modes, parameters can be adjusted to change the output data rate. In particular, the on – board pre – summing can be set to values between 1 and 8, providing a corresponding factor in data rate reduction, at a potential cost of along-track resolution and sensitivity to sloping subsurface interfaces. In addition, if depth of detectible features can be anticipated, the receive window size can be adjusted to receive echoes only for the period of interest to further man age the data rate. 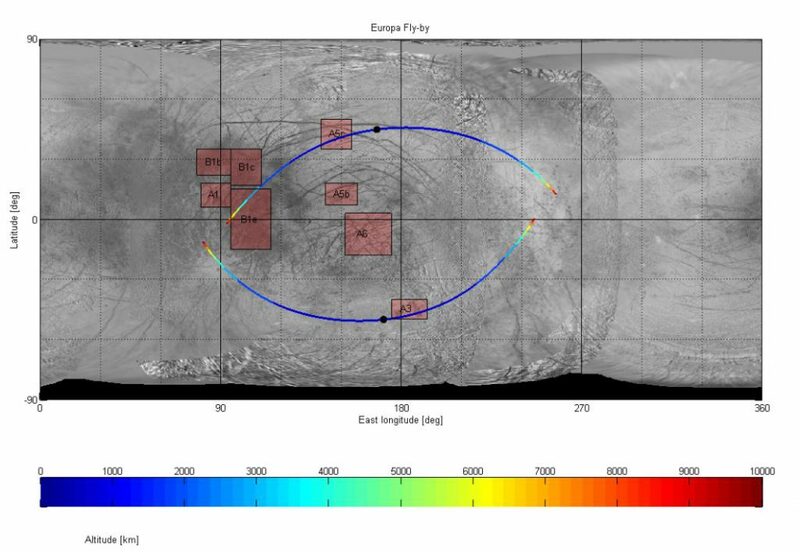 For high-priority flybys, such as the two of Europa, the high resolution mode (3 MHz bandwidth) will be used, with no pre-summing, and a receive window of 226 μs. Bruzzone, Lorenzo, et “RIME: Radar for icy moon exploration.” Geoscience and Remote Sensing Symposium (IGARSS), 2013 IEEE International. IEEE, 2013.